December’s arrived and with it comes an extra crispness in the air, evenings in front of the log-burner and a festive feeling that’s fast sneaking up on me. 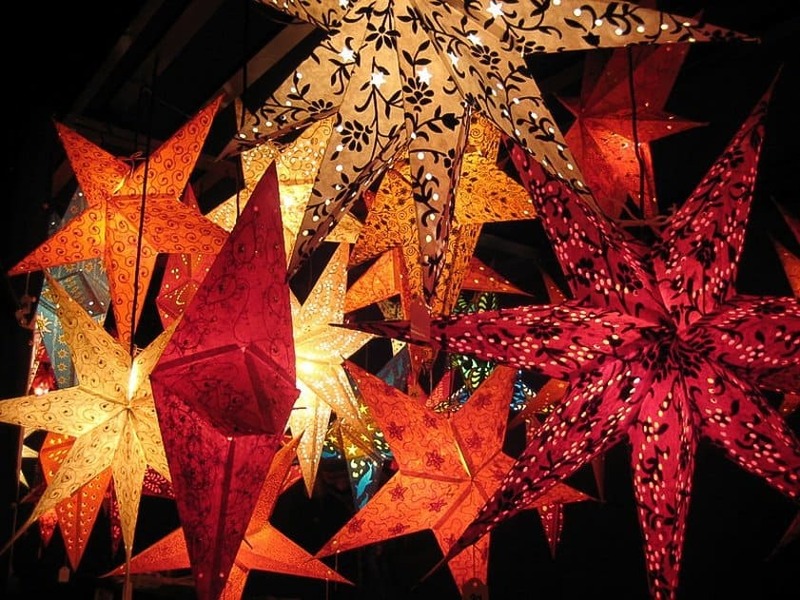 Thoughts are turning to Christmas and, if I could, I’d be heading to Europe to soak up some authentic yuletide atmosphere in a traditional Christmas market. The medieval towns do it best; Bruges was magical and Vienna’s on my wish list but Munich is home to my favourite Christmas market. Or, as the Germans would say, ‘Weihnachtsmarkt’. 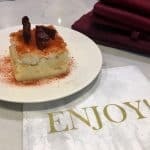 I’m taking part in Titan Travel’s ’12 Days of Blogmas’ where I’ve been challenged to create a post which focuses on a dish inspired by a trip to a Christmas market. I’m going to share one of my Christmas favourites. I first tasted German Lebkuchen biscuits at Munich Christmas market. These irresistible spiced bites are like a cross between ginger cake and a biscuit and totally capture the taste of a German Christmas. 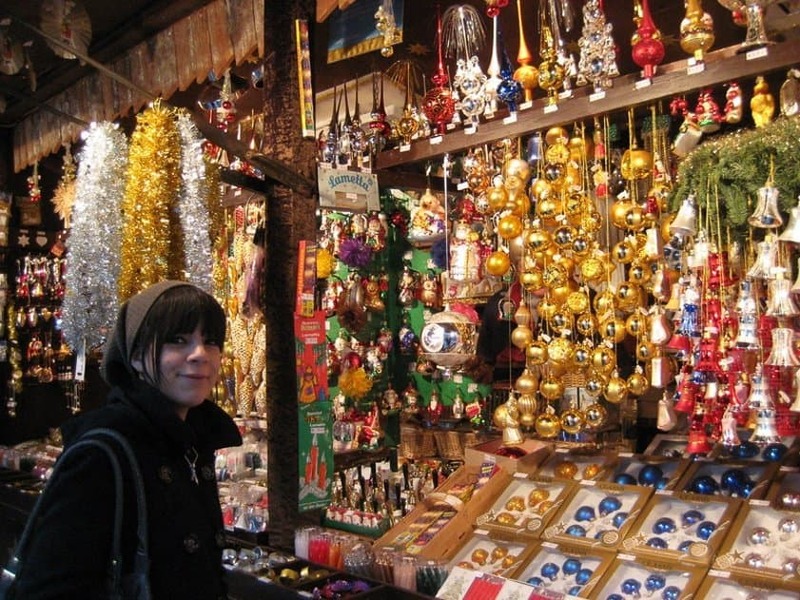 But first let me tell you a little about Munich’s Christkindlmarkt. 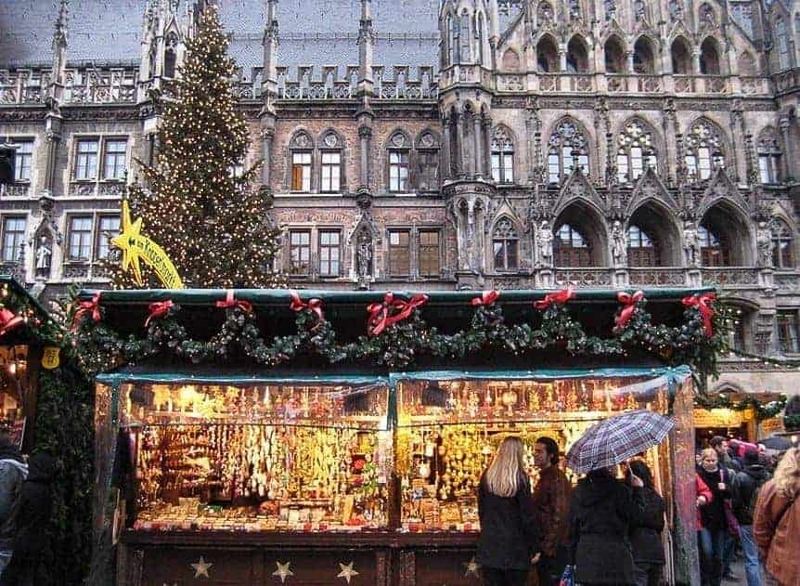 Munich Christmas market is one of the oldest in the world and dates back over 700 years to the fourteenth century. 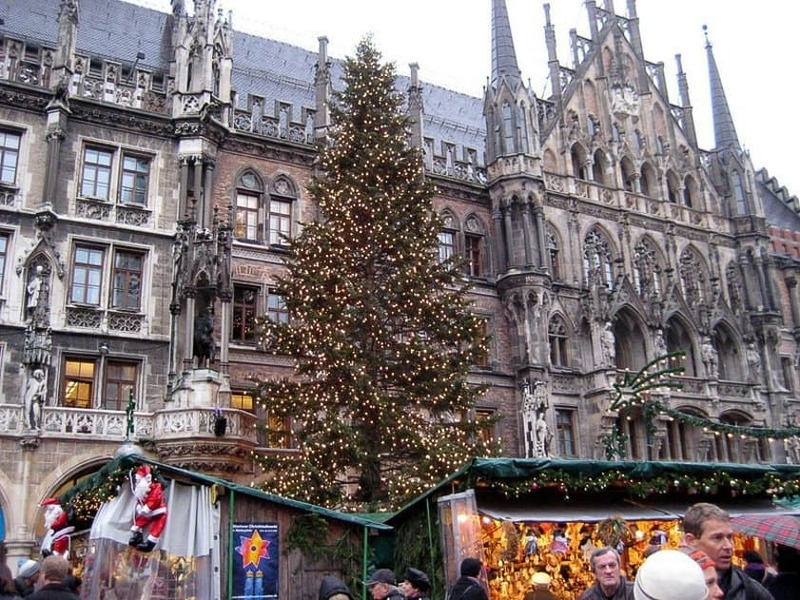 The main Christkindlmarkt is in the Marienplatz pedestrian square. The Town Hall (Rathaus) makes an impressive backdrop to the towering Christmas tree twinkling with over 3,000 lights. The sound of choirs and carols float on the night air mingling with the aroma of Glühwein, roasting chestnuts and warming winter spices. Munich in December is like stepping into a Christmas card – guaranteed to put a sparkle into the eye of the most stalwart of bah humbugs. A maze of wooden chalet-style stalls decorated with winter foliage and fairy lights fill the Marienplatz Christmas market. When I visited with my daughter Amy, we wrapped up warmly against the crisp night air and explored the stalls. We discovered some kitsch Christmas decorations and the green glass gherkin Amy bought has become a quirky family favourite. 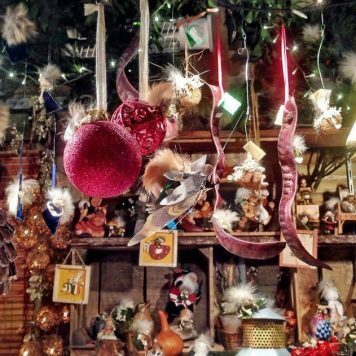 Bavarian craftsmen sell wooden carvings, blown glass ornaments and hand-made gifts. 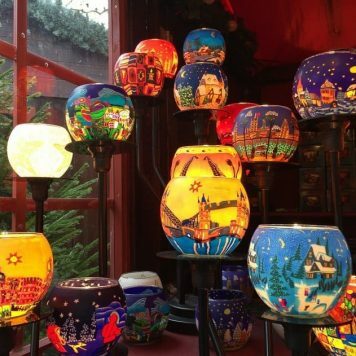 German Christmas markets are big on nativity scenes and at the nearby Kripperlmarkt, or crib market, you’ll find a range of traditional nativity scenes, cribs and wooden figures. 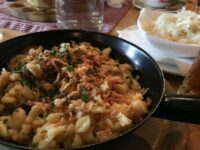 The food at Munich market is ridiculously good and was one of the highlights of our trip. 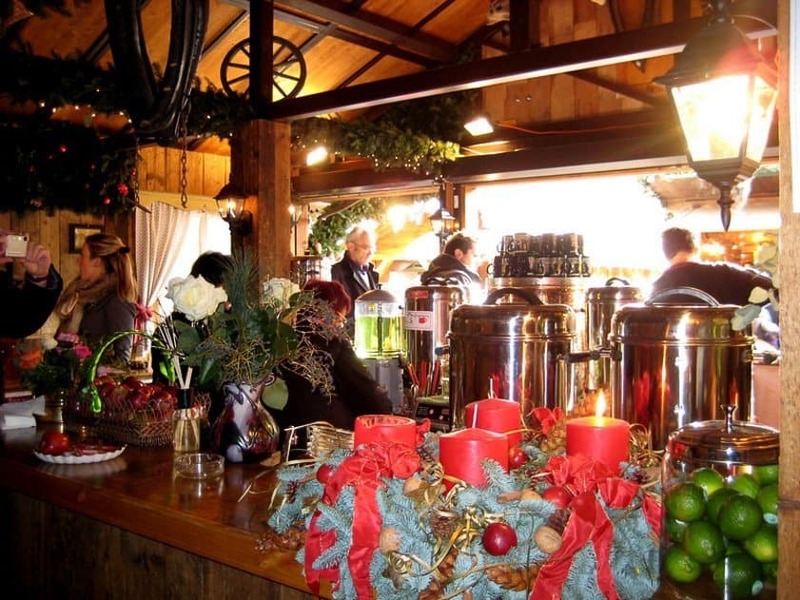 Mugs of steaming Glühwein, red wine heated up with an infusion of spices, kept the cold at bay. The smell of hot roasted chestnuts wafted around us while bratwurst sizzled temptingly and baked apples loaded with sugar slowly caramelised. Stalls were stacked with trays of fruit-laden Christollen, Strudel and Striezel. Put all the dry ingredients into a large bowl. In a saucepan heat the butter and honey over a low heat until the butter melts. Add this and the lemon zest to the dry ingredients. Mix thoroughly until you have a fairly stiff dough. Cover and leave to cool. At this point the dough can be frozen for up to one month. Heat over to 180c/fan, 160c/, gas mark 4. Put the dough on a board and cut it into quarters. Cut each quarter into 8 and roll the pieces into small, even balls with your hands. Line 2 large baking trays with baking parchment and place the balls of dough on them, leaving room for them to expand. Flatten the balls with your fingertips so they are about 5mm high or you could use cutters to make Lebkuchen stars or hearts like I did. Pop in the oven. After ten minutes check the Lebkuchen biscuits and cook for a further 2-3 minutes until lightly browned. Cool on a wire rack. 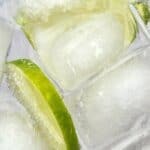 To ice, mix together the icing sugar, egg white and a little water to form a smooth and runny icing. Dip the top of each biscuit into the icing and leave to dry on a wire rack. (I re-use the baking parchment underneath the rack to save on clearing up). 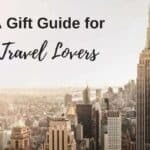 Store in an airtight container for up to five days – as if…! I love them too – they’re easy to make and the house will smell so Christmassy! 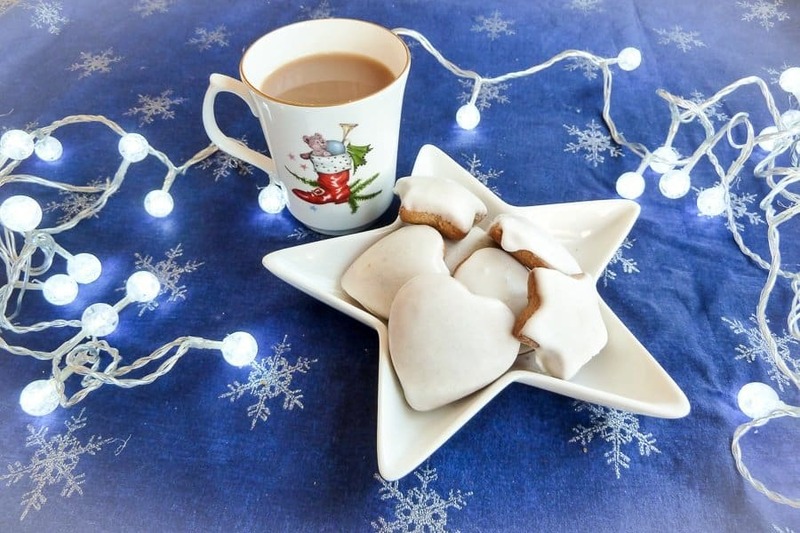 Lebkuchen cookies epitomise the taste of a German Christmas market! Wonderful recipe and I just adore the German Christmas markets! Cannot wait to return, and hope that it’s next year! Sharing this on FB and Twitter! Lebkuchen are just the smell of Christmas! Munich’s markets look lovely, I’m just back from Salzburg and although I can’t eat the biscuits any more I did pick up some Lebkuchen liquer (sort of spicy Baileys) which sounded too tempting! Lebkuchen liquer sounds delicious and very acceptable alternative! 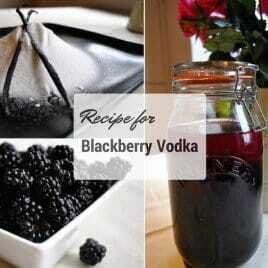 I am licking my lips reading this and they are so simple to make too! Simple to make and delicious – can’t go wrong with that! A good friend has just come back from Copenhagen and a side trip to Malmo and Lubeck. Lots of chilly, windswept photos 🙂 🙂 I had my Lebkuchen at Nottingham market last year. Not so exotic but the lovely daughter was there and that makes everything alright. Merry Christmas to you and yours, Suze! Lubeck’s meant to be beautiful Jo – I’d love to visit next year. I know what you mean – love spending time with my daughter 🙂 Happy Christmas to you too Jo and good times ahead in 2018. This takes me right back to the Christmas markets I visited in Coburg and Heidelberg – every different place seems to have a different Christmas cake or biscuit as their speciality. They all seem to have their unique touches. 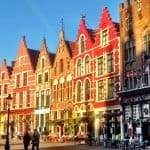 I’ve visited Bruges as well as Munich but would like to see what the French and Austrian Christmas markets are like too. 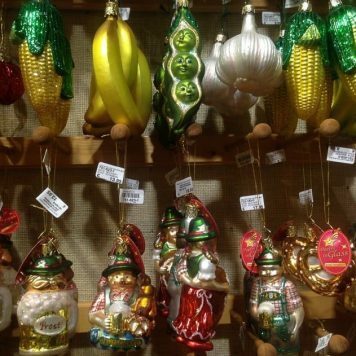 Wonderful post, Suzanne … I’m not a Christmas-fan, but I love the markets … been to Vienna (lovely), they have a couple going on at the same time. Been to Manchester that have the same set up – markets all over the city centre, I really liked Manchester in Christmas gown. Been to Lübeck, that has a very good one and Kiel … Prague, was okay, but it didn’t blow my socks off. I love Lebkruchen, but to make them myself ???!!! No way… I go to Lidl. Striezel, my favourite .. market snack. Munich, a fantastic city … but never been in the winter. Thanks for bringing me along. I love Lebkuchen, but I’m not really into baking … and I love ginger, so I buy mine at Lidl. Yes, I know .. but I love the glitter and all the light that Christmas brings. I will find out how the market is in Krakow in a weeks time. I love your post. Thanks, Mrs Jones … I hope so too .. the forecast isn’t the best, but nothing I can do anything about. Had hoped for a white Christmas, but I have to pack my new all weather jacket instead. I promise I will enjoy myself and I’m sure there will be some posts about Krakow. Thank you!